When people ask me what we’re up to in Rwanda, it usually takes them a second to process my response: We sell floors. Having grown up in the United States, I have always taken my clean floor for granted. I spent my childhood playing on the floor, and even though it was always clean (thanks, Mom! ), I was still taught to not eat anything off of it. When my little brother was a newborn, we wouldn’t dare let him play in the dirt. But the reality of poverty in the developing world is that families and their children spend the majority of their time living and sleeping on plain dirt. While I knew that the majority of people in developing countries live and sleep on dirt floors, I significantly underestimated a few things about them. It was during a class at Stanford’s design school – Design for Extreme Affordability – that I became much more aware of the negative impact of a dirt floor. And it was over the past year co-founding EarthEnable that I learned how a hybrid approach combining a market-based business model with grant funding to catalyze demand for a new product could be a highly effective way to address this problem. But first, some background on what we do and why we do it. Dirt floors make people sick, and EarthEnable’s mission is to improve the health and housing of low-income communities from the ground up. 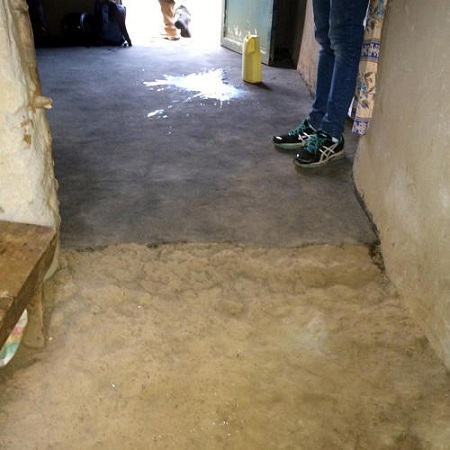 A UC Berkeley and World Bank study demonstrated that replacing a dirt floor with a hard concrete floor reduces diarrhea in Mexico by 49 percent and parasitic infections by 78 percent. But concrete is not the answer, as it is prohibitively expensive at U.S. $300 to $500 for a 20-square-meter (about 215-square-feet) home, and not environmentally sustainable. 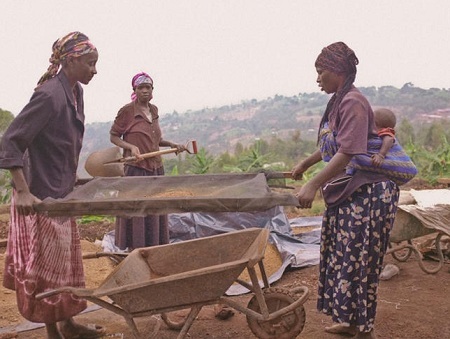 EarthEnable provides an affordable alternative to dirt floors: locally sourced, earthen floors at a price of $70, or 75 percent cheaper than a concrete floor. Earthen floors are a proven technology in the United States, where the trade has been refined to make them very easy to clean, abrasion-resistant and modern looking. They are made without industrial machinery with a mixture of compressed earthen materials – gravel, sand, clay and fibers (e.g. corn husks, dung) – and are then sealed with a drying oil (usually linseed oil, which is very costly and not available in Rwanda). c) developing a distribution model to scale without sacrificing quality. As we wrap up our pilot phase and ramp up to our market launch late this month, we wanted to share a few key lessons that may be applicable to other social enterprises. We initially planned to market our floors as a health product, given that the health, employment and quality of life benefits were our motivation for founding EarthEnable. However, we quickly realized that a clean, hard and smooth floor could instead be marketed as an aspirational product, which happen to have health benefits. We are currently testing both health-related messages and aspirational messages in focus groups. It appears messages that emphasize the aesthetic appeal and status that a clean and beautiful floor brings are more successful than health-related messages. This is, of course, not possible for all health products, and is a fortunate coincidence for our business. Distribution is always among the largest issues for any social enterprise focusing on rural customers. While we are currently directly hiring masons to install our floors, this will limit our scale. Not only are adding substantial fixed costs difficult in a bootstrapped start-up, but we expect (and have already seen) significant turnover in workers because salaried work is atypical for masons who are used to taking the highest daily rate they can get. Therefore, in the next year we will start implementing a microfranchise model, whereby masons who pass a training course will be granted rights to purchase the EarthEnable drying oil, thus becoming EarthEnable microfranchisees. Masons will set their own schedules, source their own non-oil materials and source their own clients. We will audit the floors of masons who buy our oil, and cut off their oil access if the floor does not meet our quality standards. By limiting the sales of our oil to only masons who have passed our training and emphasizing to customers the importance of using our particular oil and our qualified masons for earthen floors, we limit the risk of low-quality replicas entering the market. Our goal is to be a self-sustaining social enterprise with high volumes and low margins in the long term. However, in the short term, we know that we are selling a new product that has not been tested in Rwanda, and that is still unfamiliar for most customers. We therefore understand why masons may not trust that learning the technique is worth the opportunity cost of getting trained, and think customers are smart to want to see our floor in a neighbor’s home first. We had two options when we started, given that we were committed to a low price point: begin with slower sales that would ramp up as people gained trust in the product, or catalyze the market by investing in reducing risk and opportunity cost for both masons and customers. It would have been difficult to do the latter with equity or debt, given our low margins. Thus, we are using grant funding to spur our scale in Rwanda, so that we can then use profits from Rwanda to do the same in the next markets we enter. Of course, I’d like to be the first to point out that we are in the very early stages of testing whether many of these findings hold as we expect them to. Stay tuned in the next few months and years as we launch and learn more about this market and distribution strategy. Gayatri Datar is the co-founder and CEO of EarthEnable.